And that's why the back of each painting is documented with its location, date, time of day, weather conditions, and brief observations about the day. Many have referred to this documentation as the painting's birth certificate. Also, I encourage anyone who acquires one of my paintings to continue it's story by adding their story to it's back by simply writing about how they came about the piece, placing it in an envelope and securing it to the back. My hope is that every future owner continues the story thereby, continuing the life of the painting. 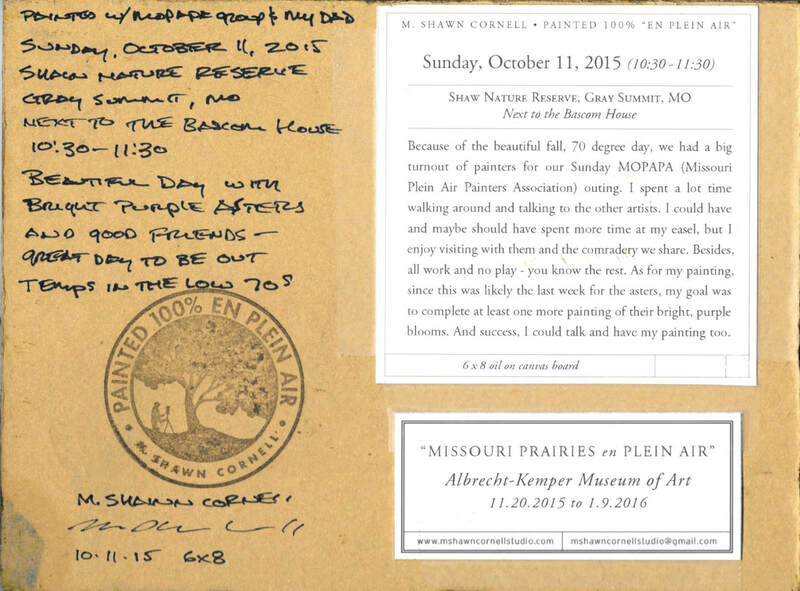 ​“Missouri Prairies en Plein Air” was a solo exhibit at the Albrecht-Kemper Museum of Art from November 20, 2015 thru January 10, 2016. It contained 128 paintings documenting Missouri’s prairies throughout all four seasons, various times of day and night, in a variety of weather conditions, along with images of controlled prairie burns, close-up intimate scenes, and vast views, all completed 100% en plein air. When imagining a prairie, the scene that materializes in many minds is a vast open space that consists of sky and horizon. My goal was to capture on canvas the far more diverse range of settings and beauty our prairies possess beyond that simple horizon line. Missouri artist M. Shawn Cornell often imposes parameters on where and what he will paint in order to force himself to look more carefully and think creatively about his plein air paintings.